Crab meat, that elusive beast. So many claim to be you, so few are! Still, we know better, do we not? That unmistakable, sweet delicate flavour delivered in an oh, so fragile flaky form. Finding the freshest of crab meats is rather tough on the average shop, so for this I simply used tinned and I assure you the flavour was not compromised one iota. The key thing here is to not drown out the crab. It’s tempting to add all sorts of spices, peppers and just extra good flavours. I came very close to using some wine with it but you must resist! Let the crab shine through. I was also tempted to use dill but refrained for the same reason, opting instead for some citrusy flat-leaf parsley. Sweetcorn is a fantastic accompaniment for crab because of it’s similarly gentle flavour and that extra crunch it gives the dish, however I’ve known people to use peas as well. 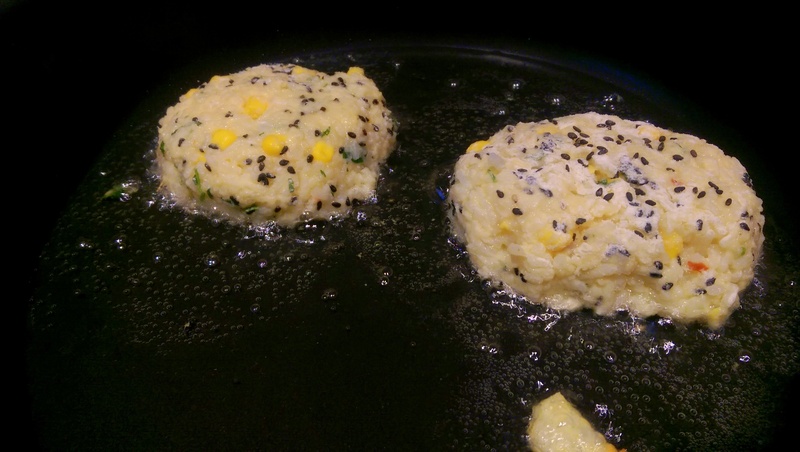 Cook your rice until fluffy in salted water with a little sprinkling of ground coriander. 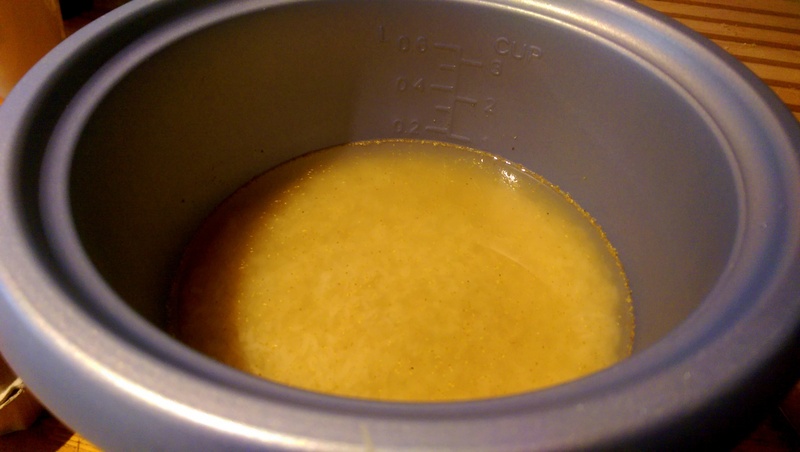 When cooked, drain, pour over a decent splash of vinegar and fluff, then let stand for at least 5 minutes. 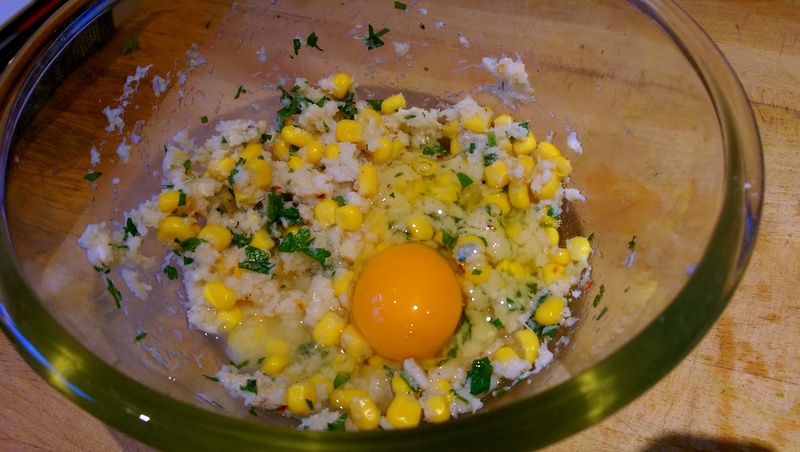 In a bowl combine the crab meat, sweetcorn, egg, herb and rice. Taste and adjust seasoning. A sprinkling of sugar might be needed for sweetness to balance out the sharper aspects of the vinegar. 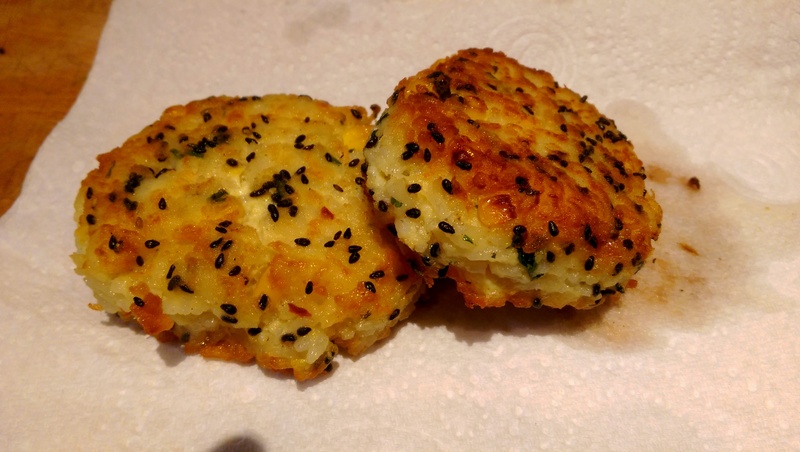 When the mixture is cool, shape into rough patties and shallow fry in a pan, no more than 2 at a time. Be careful not to handle them too much or they could fall apart! I also coated mine in some black sesame seeds I had lying around. When both sides are crisp and it holds it’s shape, remove to a paper towel to blot of some of the excess oil. I served with a simple seafood sauce made from salad cream (mayo would work fine too), tomato puree, vinegar and sugar, as well as a light touch of cooling cucumber and the obligatory lime wedge. For a final bit of freshness you can soak some raw onion in water and vinegar to remove that sharp edge but keep it’s sweetness. 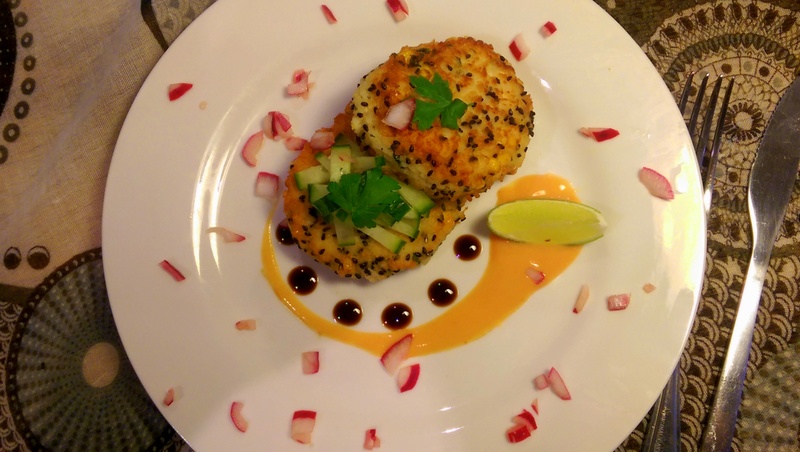 Posted in Fish, Guesscipes, StartersTagged cake, crab, dinner party, fish, food, gourmet, guesscipe, main, pescatarian, recipe, rice cake, starter, sweetcornBookmark the permalink.